Composed by Rachel M Hamilton. 21st Century. Score. 4 pages. Published by Rachel M Hamilton (S0.181491). 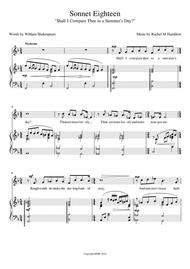 An original composition by UK composer Rachel Hamilton. 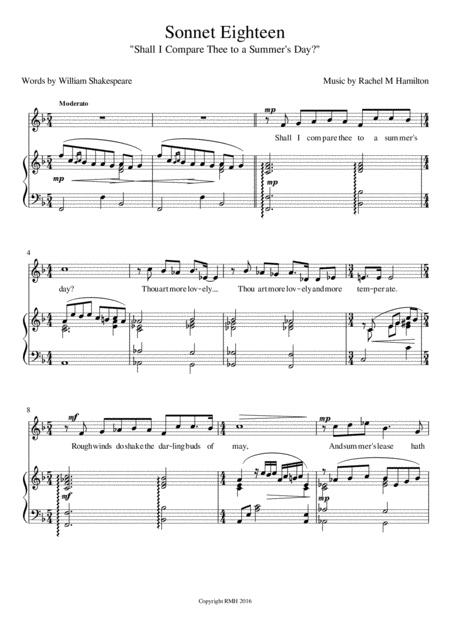 A beautiful, haunting melody for medium/high voice, set to the wonderful words of William Shakespeare's eighteenth sonnet - "Shall I Compare Thee To a Summer's Day" - written to celebrate the 400th anniversary of the Bard's death. With a flowing, lyrical piano accompaniment. Feedback very welcome at: rachelham@btinternet.com. Transposition also available on request. .